Ta da! Here’s my round one entry for the Nautical theme- a turned edge applique Billy Bass quilt. And I added sound too! Fabric – Scraps, including a perfect silver metallic print, some Architextures and the base board is a wood grain from Lush Uptown. Quilting- Woodgrain echo and also outline quilting on the fish. Trapunto added for dimension. I decided well in advance that if I made it through to the first round of Sewvivor, I was going to make a Billy Bass quilt for my nautical themed entry- he’s a sea bass rather than a river bass after all! Billy Bass is a short-lived weird gift fad from the early 2000s, therefore it only seemed fitting that I displayed him in my bathroom- I don’t have a “smallest room” for it, just the one lav’ in our house! So I made all my freezer paper templates ready from this illustration of a sea bass I found via Google Images and when I found out I was lucky enough to get through, the making properly started, and in earnest. If you want to know or try the process behind making up a design, may I point you to this tutorial I wrote previously, or any of my BOM patterns. Whilst I was gluing the seam allowances, Ange and Anita on Instagram both suggested I should make him sing. It was just too irresistible! Sadly I didn’t have the time or the expertise to make him dance too, but how awesome would that have been? Here’s the next step after making up the fish appliqué. I first made my background panel from a woodgrain fabric I had from my Lush Uptown bundle. I cut it 11 1/2″ x 18 1/2″, cut the corners rounded using tape as a template and a small rotary cutter and stuck the appliqué down with glue with a bit of toy stuffing underneath to give it a raised, trapunto effect. I also folded the ends over on a gold coloured fabric, using the reverse to mute the print, and stitched Billy on the top with monofilament and a tiny stitch. Please go and vote here! My quilt has corner triangles on the reverse so that a dowel can be used to hang the quilt. If you’re doing the same, I highly recommend adding these as you stitch the binding to the back so you can make use of the same stitching for a quick and tidy finish. 1) I decided on the placement of the button first, and drew around the button for the incision. 2) On my particular chip, you can have it push button activated or it has a greetings card style slide switch. Record the message (or play a bit of music into it as I did) using the microphone attached to the chip – I purchased the Al Green song, Take me to the River on iTunes for this purpose and played a section of it into the chip from my phone. 3) With small sharp scissors, cut out the centre of the circle drawn through all the layers, sew all the way around the edge using a satin stitch or a zig-zag with the width set very short. 4) Unplug the standard button from the chip. Feed the wire for the push button switch through the hole from the front to the back and secure with the washer and nut. 5) Now make a pocket for the chip so it can be removed for washing if necessary. Fold one edge of the 5″ square over onto the back by about 1/8″ to 1/4″. Fold over again to hide the raw edge. Press and top stitch along the edge. 6) The seam becomes the top of the pocket. Snip the two bottom corners off, no further than 1/4″ in. Fold the sides in 1/4″ and press, followed by the bottom. 7) The pocket now needs to be hand sewn onto the back of the quilt along the three unsewn edges. Position the pocket and pin into place. Sew around the edges using the same stitch as you would for hand stitching the binding down- only sewing through the backing fabric. 8) Connect the new button in the same location on the circuitboard as the original button. The chip can now be safely nestled inside the pocket, press the button and make sure it works! If you need to wash the quilt, make sure you unplug the button and take out all electrics. P.S. My next post will be my 900th! I’ll be doing a nice fabric giveaway of an FQ bundle in my next post so make sure you bookmark or follow this blog if you are new so you don’t miss out! Awesome! I love it! My kids love it! My husband loves it! 🙂 The fabric for the fish belly is a great choice and of course the wood grain background. And the congave corners. For those of us who remember Billy Bass it’s just too funny. Really great job Kerry! Incredible and the singing is just so funny! Super creative!! Just adore the way you made him sing!! Nice job!! Oh the sound just makes it perfect! Such a creative project and so well executed, I love it! OMG!!! What an incredible idea!!! Love it! A perfect addition to any Man Cave!! I also wanted you to know that I voted for your entry along with 4 others!! All of the entries were awesome! Good luck!! This made me chortle. Thomas Crapper would be proud to have this hang in his “smallest room”. I love that you made him sing, I love that you gave us a tutorial so we too could make our quilts sing. I’m in awe of your applique skills and I just can’t believe it only took you 4 hours! Well done and good luck (not that you need it!). Love this one so much! It’s been awesome seeing what everyone comes up with and their interpretations on nautical! Love that you took this to the next level and added the sound box! I love that you not only thought of this, but then went out and did it. I think it’s brilliant! I voted for you before I even knew about the song. How fun. This is too funny! You did a great job on the quilt, and adding the sound chip just makes it that much more awesome. billy! im glad youve revived him, and he looks much better then time around! such a funny addition to the entries. good job and good luck!! This is hilariously cool! Fun idea!! Seriously?! This is one of the coolest quilt concepts I have ever seen! You did such a great job with the fabric choice, appliqué, and quilting. Amazing! Absolutely genius! Love it – and I remember seeing a real life musical ornament on the wall in a fishing tackle shop. I was amused then and am amused now … LOL … very well executed project! Have voted for your and really hope you get through. This is the most creative entry by far, in my opinion! Seriously so cool! My cousin has one but I’m not sure where in the house it’s kept! Looks great – best of luck! That’s AMAZING. I’m not showing my husband for fear he will ask me to make him one. Love, love, love this. The original Billy Bass was so tacky it was classy (apologies to anyone who still owns one of these). This is such a great interpretation. Cleaver you. You have my vote. I was behind with blog reading so missed the voting. So sorry! I think this idea was ace and you describe the process so well. 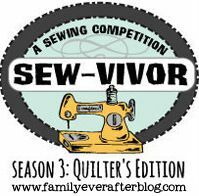 Good Luck in Sewvivor!